Domain suppression allows you to add domains, or specific email addresses, that will be permanently suppressed on all campaigns regardless of anything that would otherwise include the contact. 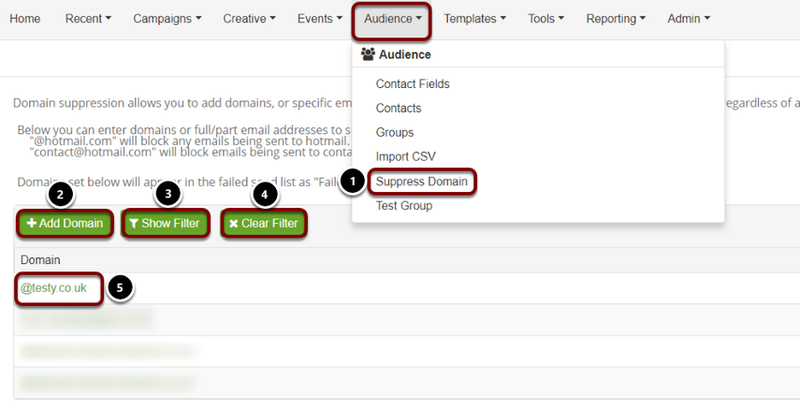 Hover over the Audience Tab then click 'Suppress Domain'. Click here to add a new domain or email address. This is the domain or email address that is being suppressed. Once clicking "Add Domain" the pop-up above will appear. Enter the name of the domain/email you want supressed. Click "Create New Domain Suppression". It will now be added into the suppressed list.